As a nutritionist, I am constantly recommending clients to try to incorporate at least three vegetarian meals per week for optimal health. 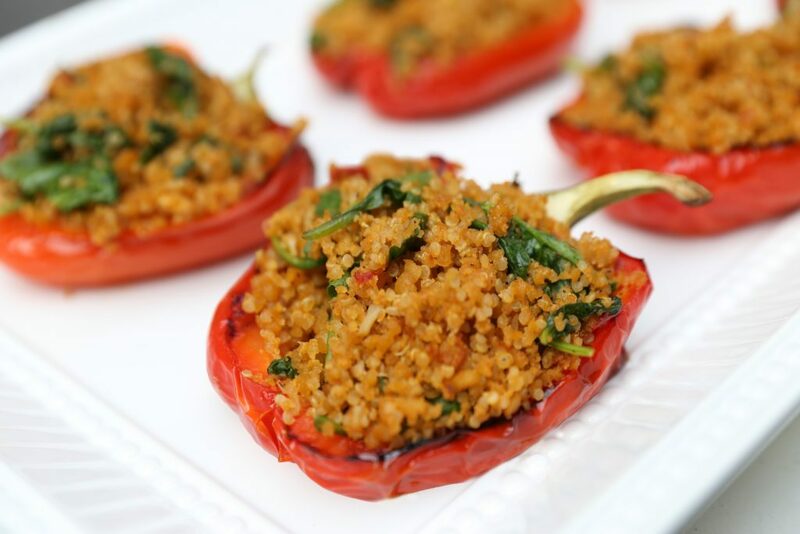 These veggie ground stuffed peppers are a perfect place to start. They are loaded with fibre and contain a great serving of plant based protein. Begin by washing the peppers and slicing them into halves. Remove the seeds and rub each pepper with some olive oil. Lay each half of the peppers onto a lined baking sheet and bake them face down for 20 minutes at 400°F. Meanwhile, place one Tbsp of olive oil into a pan and add both packs of vegetarian ground. Allow it to cook slightly on medium-low heat. Add the already cooked quinoa and the spinach. Cook the ingredients together until the spinach becomes tender. Turn off heat and set aside. When the peppers are cooked, place them face up and add two Tbsp of the vegetarian ground mixture into each bell pepper. Enjoy!